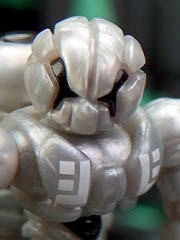 Red seems to be a popular color for Glyos but one that doesn't seem to show up enough to meet demand. The Gendrone Rebellion Mimic Armorvor is quite similar to the original Venjorun flavor, except now it has a metallic/pearly sheen on it. As always, deco is everything on these figures because changes to the actual mold are uncommon. A new head would be astoundingly exciting after a huge array of these guys, but the wolfy little fellow is a fast seller and it seems demand for this sculpt is still unmet. People love these things. Another awesome drop! Glow-in-the-dark and silver are popular colors, and that's the order of the day. Click here to see the February 23 2014 Onell Design drop menu. A silvery Armorvor, glow-in-the-dark Sarvos, and even some vinyl pieces (which already sold out) are on deck tonight. The vinyl conversion set sold out in a few minutes, and vinyl hasn't been around much as of late. The obvious new part is Argen's new head, available in either glow or silver. Get while the getting is good, kids. Check out the new Mission Details over at Onell Design. Sunday, February 23 at 9:30 PM EST. New colors include glow-in-the-dark, a silver based on the Marvel Legends 2013 Ultron, and a metallic black that has to be seen to be believed. I saw it in person this week, and I still don't believe it. New parts include a new head for Argen, which will undoubtedly be the big winner in this round. Click on over for more pictures and details!